You might remember that I posted about Grocery Outlet before in my Velvet Elvis Smoothie post. And, if you don’t remember that, you might be asking, “What is Grocery Outlet?” Well, my friends, Grocery Outlet is a great place to shop because you can save money AND eat healthy. They always have great bargains and great products. Make sure to check out their NOSH section (NOSH stands for Natural Organic Specialty Healthy)! We always have fun exploring the store and the fun stuff they stock (the selection is always changing). Experience Grocery Outlet for yourself! Visit your local Grocery Outlet and head over to the NOSH section! Make sure to take a look at all the great healthy products they have. 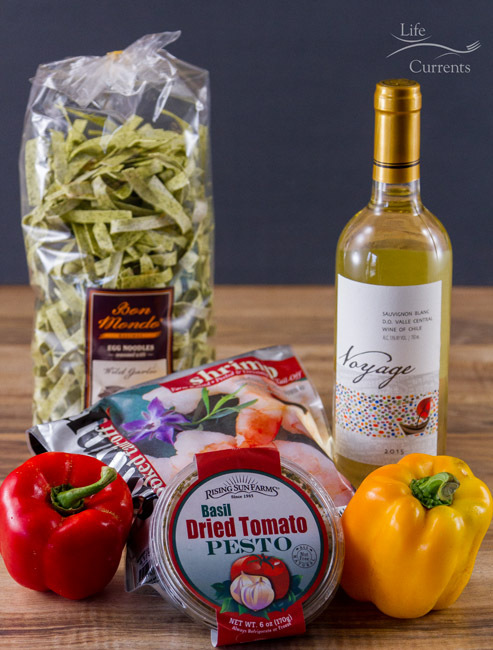 Everything that you see in my Creamy Pesto Shrimp Pasta recipe came from Grocery Outlet. Including the yummy wine that I paired with this pasta dinner. I picked up this Voyage Sauvignon Blanc because I thought it would pair really well with the shrimp dish (and it totally does!). I’m a white wine girl, so I always look for tasty Sauvignon Blancs; the Grocery Outlet had a great selection! I can’t wait to try the other wines I picked up. Grocery Outlet has amazing deals on wine and food, but it is not just the price that matters – it’s what you do with it! The convenience of making a super tasty dinner that comes together with just a few ingredients and in just a few minutes means you can spend more time with your family and friends eating yummy food and laughing. This Creamy Pesto Shrimp Pasta is so good and so easy. We actually picked up one of these containers of Basil Dried Tomato Pesto the last time we stopped over at Grocery Outlet. I’ve been using it in so many places – on grilled cheese sandwiches, just simply served over pasta, with crackers and cheese, so many options. 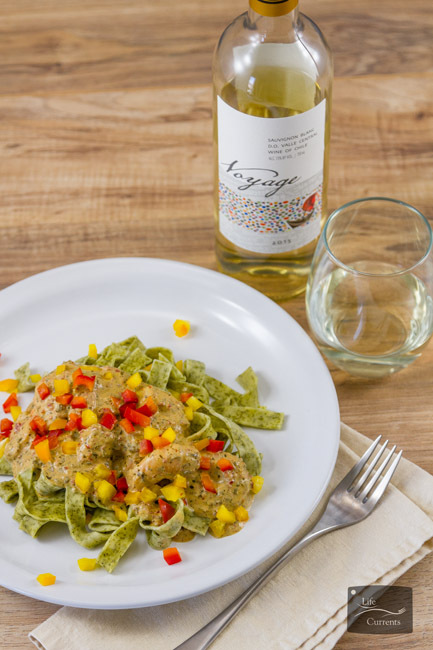 The sauce on the Creamy Pesto Shrimp Pasta is a nice rich creamy and full flavored sauce. The bell pepper pieces are a nice light bright note with the creamy sauce (which by the way they have a wonderful produce selection there). And that pretty green pasta you see in the pictures, I found that at Grocery Outlet too. It’s Wild Garlic Egg Noodles! Awesome!